I have just finished my second year of a post-graduate diploma in conservation in wood and stone at City & Guilds of London Art School. The course thus far has given me a base in craft skills including stone and wood-carving, gilding; japanning, lime and drawing. It is from this understanding of how objects are made that one can better understand how objects fall apart. The second year has focused on conservation science and its practical application. A basic understanding of chemistry taught in first year has been essential for this. At the end of second year I know how to use appropriate cleaning methods (both choice of cleaning material and its application) and have a basic understanding of the chemical and physical properties of the objects I am working with. As well as learning about cleaning methods for artifacts I have been able to explore methods of technical examination such as the use of UV light and taking cross sections to help determine the make-up of decorative surfaces. Furthermore, City & Guilds fortunately has access to technical equipment like a laser (for cleaning stone and plaster objects) and FTIR; this uses infrared light to identify elements in any given sample. Both of which are valuable tools (especially within the museum sector) that help to give a better understanding of the object one is treating. Work experience on objects has enabled me to practice technical analysis as well as complete tasks such as consolidation, re-attachments (using adhesives and dowels) and re-touching. During a summer placement at Watts Gallery, Surrey in 2013, I undertook conservation work on a plaster sculpture, which involved removing rust stains left from iron dowels in the sculpture, consolidation, remodeling and toning-in. Research included taking paint samples and analysing the cross sections to discover that a painted bronzing technique was used, which aided with toning in. 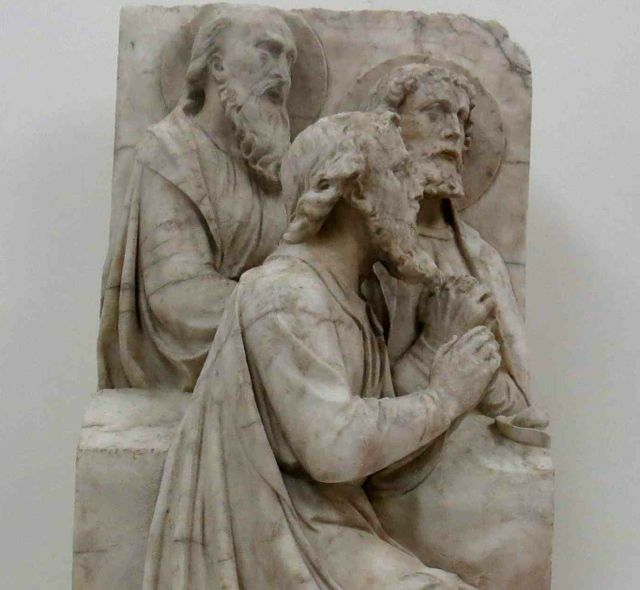 I have particularly enjoyed working on an alabaster sculpture from the Vestry House Museum, Walthamstow. 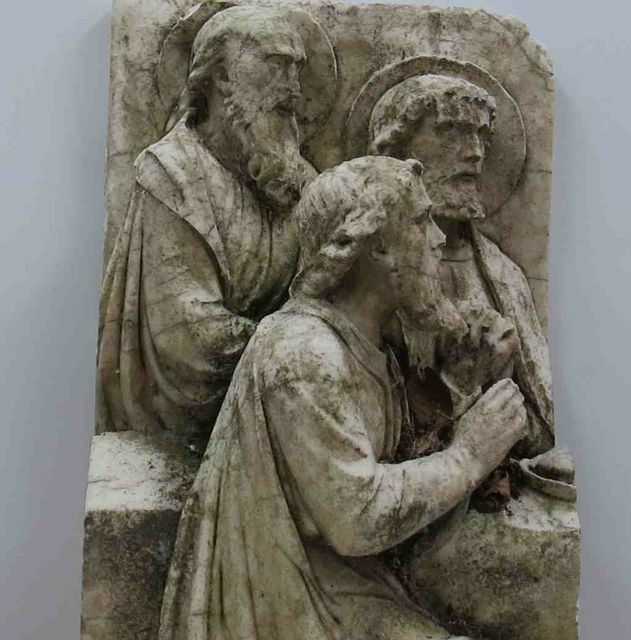 The sculpture is part of a frieze that had been removed from a church and kept in poor conditions where it was exposed to water for many years. Alabaster has the same chemical composition as plaster and therefore it is partially soluble in water. This meant that the frieze had badly degraded as well as accumulating a large amount of dirt. Research into the cleaning and consolidation of alabaster has been immensely interesting as well as challenging to track down and this is a subject that I hope to investigate further. The final treatment included dry brush cleaning, solvent cleaning and laser cleaning. In addition, re-attachments had to be made as well as an entire reconstruction of a missing corner. The treatment was very demanding; both in terms of finding the right methods for cleaning and reconstruction and also from an ethical standpoint: how far should one conserve or restore an object? Another project that has been particularly enjoyable is the frame conservation module. Learning about different historical methods of wooden frame construction and decoration has been fascinating. I carried out conservation work on a composition rococo Victorian revival frame. The treatment involved casting missing elements of decoration and re-applying, making past restorations coherent and finally re-gilding the entire frame. Gilding is a craft I have very much enjoyed and would like to pursue in the future. As well as work in the studio there have been several onsite projects. These have included preventative work at Westminster Abbey, St Paul’s Cathedral, Rochester Cathedral and Kensal Green Cemetery. This has taught me about the practicalities of working in active buildings and outside. It has highlighted how one should adjust methods of conservation treatment to accommodate accessing difficult areas and health and safety issues for the public. This summer I have a placement at the V & A in the sculpture conservation department. Here I hope to gain experience in a museum environment, focusing on wood and plaster objects. In addition, I will be taking part in a frame conservation project at the Palace of Westminster, recording the condition and carrying out some conservation treatments on their vast collection of frames. I am looking forward to taking everything I have learned this year and applying it to my research project in my final year beginning in September. Because of my experience with alabaster and the lack of information about cleaning methods I hope to explore this subject further. In addition to the research project, I hope to take on a frame as one of my final-year conservation objects as well as a plaster object, which I am increasingly drawn to as plaster objects are gaining value as historical documents. How to treat plaster due to its high porosity as well as dealing with major rusting from large armatures is something I would like to explore further, as well as different methods of treating various coatings applied to plaster. This subject has similarities to the problems with treating alabaster and I hope they will compliment one another. Once I graduate from City & Guilds I hope to work on historic buildings both the interior and exterior as I would love to work with artifacts that are within their historical context. I am very much looking forward to the year ahead at City & Guilds of London Art School and I thank the Anna Plowden Trust for their help, without which I could not complete the course.